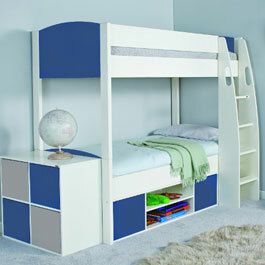 Bunk beds for kids are a popular choice amongst both kids and parents. These beds are fun, practical, maximise space and give kids lots of opportunities to personalise their bedroom. Have a look at any of the great range of bunk beds from Stompa and see how much storage and living space can be created from a relatively small floor area. White is a popular choice as it blends in well, allowing you to complement a rooms colour scheme with soft furnishings. Choosing White also means more long term value & flexibility as cushions, throws etc can be changed to match a new decorating theme, leaving White as a complementary colour. Storage units with drawers, open shelves, pull out extending desks that have extra storage built in, soft furnishings and more from our ranges. We take time to listen to our customers, and most importantly the kids themselves. We know that space is often a premium that gets more valuable as children grow and gain more interests and hobbies. This is why we use ALL the space we can and create an interesting environment for play, one that encourages neatness plus personal space for kids to express themselves and display their treasured possessions and mementos. 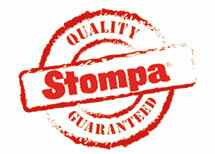 To view our range of Kids Bunk Beds please click here.